OS grid reference SK 2156 6848. 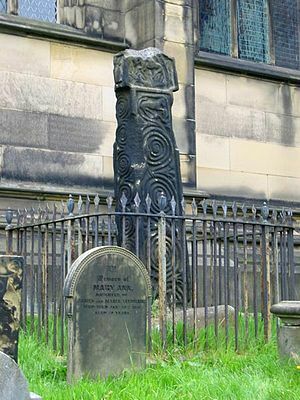 In All Saints’ churchyard on Church Lane, near the centre of Bakewell, Derbyshire, stand two rather weather-beaten Anglo-Saxon, Mercian-style crosses known collectively as Bakewell Churchyard Crosses. The tallest of the crosses has lost its head, rather sadly, while the smaller cross known as ‘Beeley Cross’ is what you might call ‘a stumpy shaft’, although it has the best surviving carved decoration of the two. Inside the porch there is a large collection of Anglo-Saxon and Norman stones and, in the church itself another collection of ancient stones known as ‘The Bateman Collection’. The town of Bakewell in the centre of the Peak District National Park is on the A6 Derby to Manchester road, and Matlock is some 8 miles to the south-west on the A6, whilst Buxton lies 9 miles to the west on the very same road. Near the east wall of the parish church, beside the outer wall of the Vernon Chapel, stands the best-known of the two crosses here; however it’s carvings are now quite warn and most of the head is missing and because of this it is only around 8 feet high now. It is said to date from the 7th to 9th centuries AD and is very similar to the Eyam Cross in Derbyshire, although that particular cross retains it’s head! The cross was almost certainly carved here at Bakewell as there was apparently a thriving stone-carving operation going on, supplying the northern part of the ‘Kingdom of Mercia’ – that’s why there are so many carved crosses and stones in this ‘one’ place. The cross originally stood at a cross roads just south of Hassop village about 1 mile north of Bakewell. On the east face three large vine-scrolls with grapes in their centres and vine leafs in the spaces around the scrolls; at the bottom a cross in a circle and at the top, below the damaged head, a creature holding something in it’s paw and it’s long tail curled around it’s back, while above that a horse is trampling on a human figure? The west face has four arched panels showing the Annunciation, a figure holding a cross, another figure holding a horn and a figure that is now worn away. These figures might be Odin and Loki from pagan Norse mythology. On the north and south faces scrolls turning in opposite directions. The north face also has a crucifixion scene with soldiers on either side, one with a spear and the other holding a sponge. The cross-base is a large, unhewn lump of stone but probably not as old as the cross? The carvings on the smaller 10th century cross known as ‘Beeley Cross’, which is 5 feet 4 inches high, are better preserved. This cross was dug up in a field at Holt House 1 mile north of Darley Dale or, alternately it was dug up from beside the Chatsworth to Alfreton road (B6012) near Screetham farm at Beeley during the 19th century and, later brought to All Saints’ churchyard, Bakewell. Carved onto this cross there are circles (spheres) linked-together (top and bottom) on all it’s four faces, varying in size, with slightly smaller spheres inside and crosses or wheel-like patterns (banding) across these or, according to Neville T.Sharpe in his excellent book ‘Crosses of the Peak District‘ “interlaced carving with the interstices filled with small hemespheres” – reminicent apparently to the Saxon cross at Hope church, Derbyshire. There is other decoration too including groups of dots in circles. The cross-base is perhaps of a late medieval date and stands at 2 foot high and 2 foot 7 inches wide with nicely chamfered corners. In the south porch (now the main entrance) there is an amazing collection of upto 40 Anglo-Saxon stones, some quite large, piled one on top of the other; there are cross-fragments, pieces of grave-covers, of all shapes and sizes, as well as some grotesque ‘Celtic’ stone heads that may in fact be medieval, while on the opposite side there are carved Norman stones. At the rear of the church another pile of ancient stones known as The Bateman Collection, named after Thomas Bateman (1821-61) the English antiquarian and archaeologist who collected them together in 1842. Among this collection are a number of cross-shaft pieces. These were restored to the church in 1899 after residing in the Weston Park Museum at Sheffield. The 14th century font is carved with various figures and the rood-screen dates from the 15th century. Standing against the outside wall a collection of medieval coffins, shaped to fit the bodies that were in them! All Saints’ is a partly Norman and Early English church, but they was undoubtedly a Saxon church of the 7th century here before the present-day building, perhaps even a Romano-British settlement? Sharpe, Neville T., Crosses Of The Peak District, Landmark Publishing Limited, Asbourne, Derbyshire, 2002. Clarke, David., Ghosts & Legends of the Peak District, Jarrold Publishing, Norwich, 1991. Jones, Lawrence E. & Tricker, Roy., County Guide To English Churches, Countryside Books, Newbury, Berkshire, 1992. Pickford, Doug., Earth Mysteries of the Three Shires, Churnet Valley Books, Leek, Staffordshire, 1996. Categories: Ancient Crosses, Bakewell Churchyard Crosses in Derbyshire | Tags: Ancient Crosses, Bakewell Churchyard Crosses at Bakewell in Derbyshire | Permalink. OS grid reference SE 7842 9011. On the North Yorkshire Moors at the edge of the Tabular Hills, above Rosedale Abbey and Goathland, stand the well-defined and grass-covered earthworks, ramparts and ditches of what are called Cawthorn Roman Camps; actually one Roman practice camp and two small Roman forts, side by side, just north of the road called High Lane between Newton on Rawcliffe and Cropton, some 4 miles to the north of Pickering. They are surrounded by woodland. A fairly well-preserved stretch of Roman road (Wade’s Causeway) runs due north over Wheeldale Moor from Cawthorn to Lease Rigg where there was another small Roman fort; originally it may? have connected up with the Roman camp, fort and settlement at Malton (Derventio or Delgovia?) further to the south and was perhaps 20-25 miles in length. But did the Roman road turn east at Lease Rigg and head to the coast at Ravenscar? Cawthorn camp and it’s adjoining forts were built in the late 1st to early 2nd centuries AD. At the southern-side of the earthworks are two prehistoric burial sites (tumuli) and there’s another tumulus at the north-west-side, all of which pre-date the Roman earthworks. The Whitby road (White Way Heads) is 5 miles to the east. The two small forts, annexe and camp are identified as ABCD. In the centre between the two forts is the temporary marching (practise) camp, which has been referred to as a ‘siege camp’ by some Roman historians. Cawthorne camp C is unusually-shaped like a coffin (elongated) and measures roughly 300 feet by 850 feet about 4-5 acres – and is located between forts D and A. There are three gateways, at the eastern-side only, and these are protected on the outsides by claviculae (cuspate gates) in the ramparts. What maybe gaps at the north-west and south-western corners could have also been ‘initially‘ gateways but these were probably closed up. But the camp has no real ‘robust‘ defensive ramparts, or very little, apart from what appear to be back-filled ditches, unlike those of fort D. The defensive ramparts surrounding the adjourning rectangular-shaped fort D are well-preserved and are 4-5 metres high, while the outer ditches or ‘workings’ are called ‘Stracathro-type’ and are some 3 metres wide and 0.7 metres in height; this fort slightly overlaps the camp at the south-eastern side and is of a later date of construction. It seems likely the camp and forts were built by the legions from York (Eboracum). Fort A with it’s annexe B (extension) at the eastern-side of the site is less well-defined; it has 4 gateways opening into the annexe section, now a low earthwork of 3 metres high. The adjoining annexe has two gateways north and south sides. These two cover an area of around 6 acres. Apparently the forts and camp here at Cawthorn were occupied in more recent times – at periods during the Dark Ages and the Viking Age, the 6th-10th centuries AD. But why did the Romans build these forts and camp together high up on the Yorkshire Moors. Was it a show of military strength to the northern, British tribes, or was it to protect the Roman road, or even the high ground and the defense of their forts to the north-west and south. More likely they were built simply to house Roman garrisons who were on military manoeuvres and, others who were here to build the Roman road that is so well-preserved, even today. Almost certainly the soldiers could see the east coast from here and the many signal stations (warning beacons) that were situated along that coast. The site was excavated between 1924 and 1929 and the conclusion being that the camp and forts had been occupied twice for short periods only, maybe some 6 to 10 years apart, and that construction took place somewhere between 80-120 AD. Some pottery and glass beads were found during these archaeological digs. The short stretch of Roman road, known in Yorkshire as Wade’s Causeway, runs for 12 miles between Cawthorn Roman camps and Lease Rigg Roman fort, but originally it may have started at the Roman settlement of Malton and, from Lease Rigg ran east to the coast at either Ravenscar or Whitby, a distance of 25 miles, though there is much uncertainty about this. Today, it is quite well-preserved though the top section has long since eroded away leaving it’s bare foundation stones underneath, but it’s water gulleys or ditches can still be seen at either side, allowing rain water to run off. According to legend, the road was built by an 11th century giant called Wade (Wadda) of Viking birth, who lived with his wife Bell, also a giant, at Mulgrave Castle near Whitby. Bell or Bella apparently carried large stones in her apron to help her husband build both the castle and road, according to the Legend. Their son was the famous Wayland the Smith of Viking legend! At the southern edge of the site, in woodland, there are two prehistoric burial sites (tumuli) that pre-date the Roman earthworks by 1,500 years, dating from the Bronze-Age. These are located at SE 7845 8987 (south-side) and SE 7790 8980 (south-west side). A third tumulus, of Iron-Age date, can be found at the north-west side of fort D at SE 7780 9010. Well worth checking out. Boyes, Malcolm & Chester, Discovering The North York Moors, Smith Settle Ltd., Otley, West Yorkshire, 1996. Jones, Rebecca H., Roman Camps In Britain, Amberley Publishing, Stroud, Gloucestershire, 2012. Categories: Cawthorn Roman Camps in North Yorkshire, Roman Sites | Tags: Cawthorn Roman Camps in North Yorkshire | Permalink. OS grid reference SD 7599 3782. On Wiswell moor above Sabden, in Lancashire, stands the prehistoric site known as Jeppe Knaves Grave, said to be named after a 14th century robber who was buried here, but it is in fact a Bronze-Age cairn that is now much mutilated and in a bit of a ‘sorry state’, although its rounded-shape can still be seen with a hollow at the centre. There are a number of footpaths heading to the site: it can be reached from Wiswell and Spring Woods (Clerk Hill road) on the A671, near Whalley, or from the Nick of Pendle along the road that runs between Sabden and Clitheroe over Pendleton Moor, where there are a number of car parking areas. From here there are at least three footpaths that reach the site – the lower one (an ancient trade route) taking you through Wilkin Heys farm where you will need to ask for permission; the other two paths will get you there but one or two ladder stiles will have to be negotiated! The moor can also be ‘quite boggy’ in times of inclement weather. In his book Pendle Hill and Its Surroundings, by Dr Spencer T. Hall, the author says “From Whalley it will be tolerably easy to find a route up by Wiswell to Pendle Hill”. He also mentions coming up via Padiham, Higham, Sabden, Clitheroe, Chatburn, Downham and Worston. In any case, best to head for the concrete trig point/pillar known as ‘The Rough’ no s4675 (at 315 feet) on Wiswell Moor, and then walk along the path (430 metres) to the south-west over the ladder stile, past the shepherd’s rock shelter, and there ahead down in the turf and heather is the prehistoric round cairn with it’s stones scattered about both on the inside and around the edge. 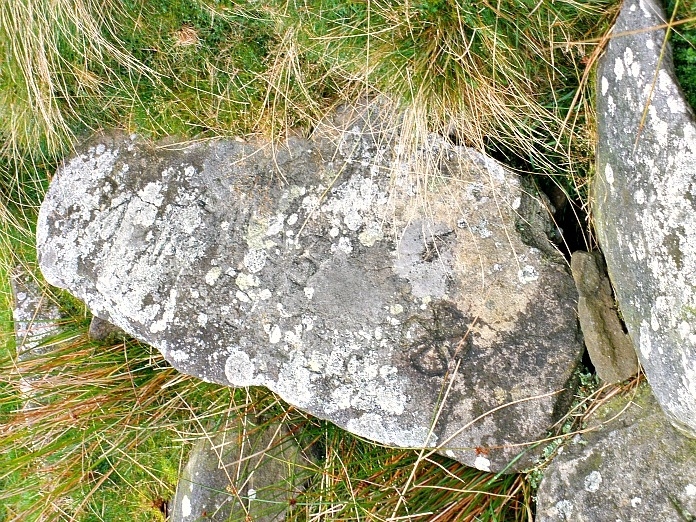 In the book ‘Journeys Through Brigantia (Volume Nine) The Ribble Valley’ by John & Phillip Dixon, the authors say: “To the west of Wilkin Heys, just below the triangulation point, is a small depression in the moorland turf containing rocks and stones of various sizes. Upon the largest stone are inscribed the words ‘JEPPE KNAVE GRAVE’ and a cross. The stone is said to mark the final resting place of Jeppe Curteys, a local robber who was decapitated for his crimes in the first year of Edward III, 1327”. 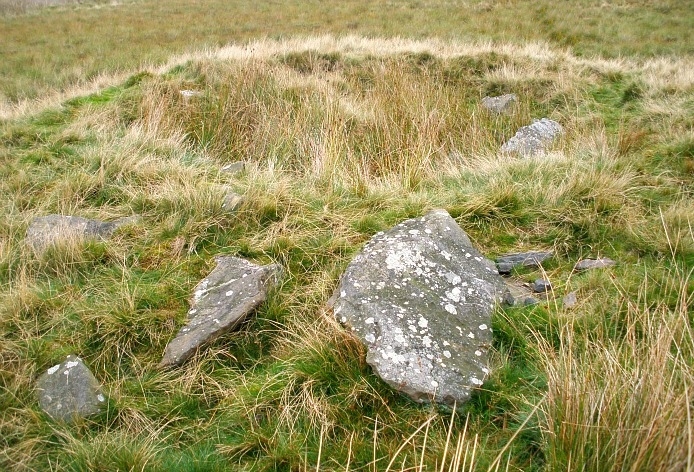 The circular-shaped cairn is about 15 or 16 metres in diameter (22 feet) and it’s stone filled hollow in the middle is 5 metres by 3 metres. An outer ring of stones, which vary in size can be made out amongst the grass, but it is not particularly circular. Some larger stones make up the cairn (tumulus) itself but are in a somewhat tumbled, mutilated state. Some historians believe this was originally a chambered tomb of the Neolithic Age, though in fact it probably dates from the Bronze-Age. At the side there is a large stone with a worn inscription that says: JEPPE KNAVE GRAVE as well as a small incised florrated cross, thought to have been carved in the 1960s by boy scouts. 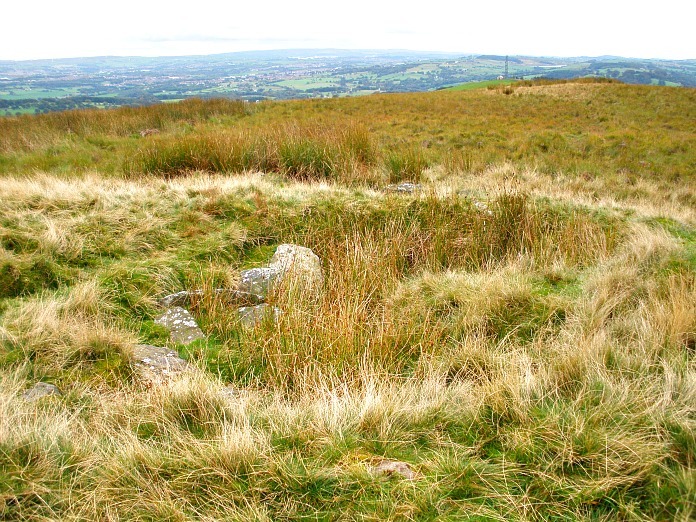 According to the legend, Jeppe Curteys (Geoffrey Curtis), a highwayman was hanged for his crimes of robbery in 1327, and was subsequently buried here at this solitary spot (in a pre-Christian grave) on Wiswell Moor. The word “knave” is usually taken to mean ‘a wrong doer’, but it could also be the Norse word for a boy, youth or servant. The suggestion is that is much more likely to be an earlier prehistoric or Dark-Age burial site for some noble chieftain, and so pre-dating the highwayman by a few thousand years. But, we may never really know the true answer with regard to this ancient site. About 1 mile to the north-west of Jeppe Knaves Grave at Carriers Croft near Pendleton is another (possible) Bronze-Age site. Here in 1968 a circular earthwork was discovered and, during excavations there in 1968-75 three collared urns and other antiquities were found. These finds were put on display in Clitheroe Castle Museum. There are two other Bronze-Age sites in this area too. Just 215 metres to the north of Jeppe Knaves grave at Harlow (SD759 380) in the direction of Parker Place and, on the opposite side of the road from the Well Springs inn at Nick of Pendle, along a footpath (SD776 390), there is another earthwork that may be prehistoric in date? (See John & Philip Dixon’s book – Journeys Through Brigantia (Vol 9) The Ribble Valley). Also, there are a number of glacial erratic boulders in the area, some having been used to prop up farmers’ walls! or put into use as marker stones. Dixon, John & Phillip, Journeys Through Brigantia (Volume 9) The Ribble Valley, Aussteiger Publications, Barnoldswick, 1993. Hall T, Spencer Dr., Pendle Hill and Its Surroundings, (orig. published 1877) re-published by Landy Publishing, Staining, Blackpool, 1995. Categories: Cairn / Cairn Circle, Jeppe Knaves Grave at Sabden in Lancashire | Tags: Jeppe Knaves Grave near Sabden in Lancashire | Permalink.